Fans and collectors have been patiently waiting for DeMarco Murray to consistently deliver on the glimpses of greatness that were on display early in his career. After a good 2013, Murray is off to a blazing start in 2014 and the market has started to pick up for the Dallas Cowboys' top running back. After participating in the U.S. Army All-American Bowl following his high school career, DeMarco Murray made the decision to play college football for the University of Oklahoma. He played all four seasons of his eligibility and finished on a high note, rushing for over 1,200 yards and 20 total touchdowns in his senior year. He entered the 2013 NFL Draft as an appealing early-round running back option and was selected in the third round by the Dallas Cowboys. DeMarco Murray battled injuries and the depth chart during his first two seasons with the Cowboys. 2013 was a turning point as he remained relatively health and totaled 1,100 yards and nine rushing touchdowns. That consistency carried over to 2014 and he has been one of the top backs in the league. Given the media focus and considerable fan base for the Cowboys, if Murray keeps this up and the team continues to win, demand for DeMarco Murray cards will skyrocket. 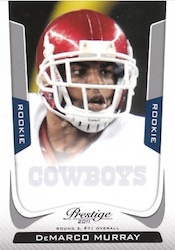 The following guide looks at some of the top DeMarco Murray rookie cards available. View a complete checklist for his rookie cards by clicking the "Rookie Cards" tab above. Click on the listings to shop for singles on eBay. 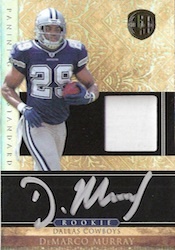 Highlighted by an on-card autograph, awesome patch swatches and a numbered print run fewer than 100 copies, it is arguably the best DeMarco Murray rookie card. 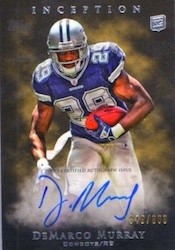 While many of the 2011 Topps Five Star rookies are numbered to less than 100, the print run of the DeMarco Murray sits at 130. As a result, the comparison between it and his National Treasures rookie isn't much of a contest, especially when you factor in the small patch swatch. 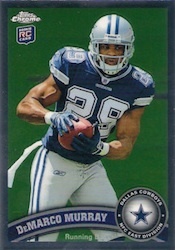 Still, this is a highly collectible DeMarco Murray rookie card and will always command a great deal of attention. 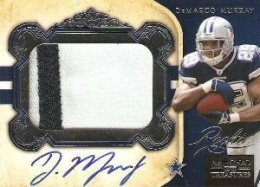 Murray's Certified rookie features a dual jersey swatch and on-card autograph. The design has a lot of white in contrast to the small jersey pieces, which seems like a waste. One of the better-looking 2011 DeMarco Murray cards, his Gold Standard rookie has an on-card autograph and small jersey piece. The print run is on the higher side but the card quality helps the overall value and appeal. 2011 Gold Leaf Rookie DeMarco Murray Material Autograph 48 50! 2011 PRESS PASS SIGNINGS DEMARCO MURRAY BLUE AUTO #ED 50 50 MINT! ROOKIE! Below you will find an example of what DeMarco Murray's authentic signature looks like. This can be used as a first point of reference for determining the legitimacy of autograph memorabilia, but is not a substitute for having your items authenticated by a well-respected professional autograph authentication company.